The DS 3 Crossback will start at £21,550 when it arrives in UK showrooms in May 2019. 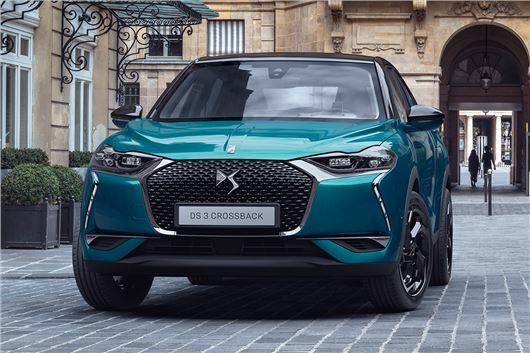 Set to replace the ageing DS 3 hatchback in the French firm's line-up, the DS 3 Crossback is intended to rival premium crossovers such as the Audi Q2 and BMW X2. Buyers can choose from a wide range of customisation options, including nine wheel designs, 10 body colours and three roof colours. There are also five 'DS Inspirations' which mix and match colours and materials inside and outside the car: DS Montmartre, DS Bastille, DS Performance Line, DS Rivoli and DS opera. On top of these inspirations, there will be four trim levels as well as a high-spec La Premiere launch edition model. The entry-level Elegance model starts at £21,550 and features 17-inch alloy wheels, rear parking sensors, seven-inch touchscreen display with Android Auto and Apple CarPlay, DAB radio, keyless start and two rear Isofix child seat mounting points. Starting at £22,950, the Performance Line adds black 17-inch wheels, dark tinted rear windows, aluminium sports pedals and a black perforated leather steering wheel. The Prestige trim is priced from £24,950 and features automatic air conditioning, automatic wipers, two USB connection points, front (and rear) parking sensors, 10-inch HD touchscreen, DS Connected 3D navigation system with WiFi and leather seats. Over and above Prestige trim, Ultra Prestige models start at £30,950 and feature 18-inch alloys, head-up display, keyless entry and start, DS Matrix LED Vision headlights, advanced safety pack (with extended emergency braking system, extended lane keeping assist and blind spot detection), reversing camera, and a black premium leather steering wheel. The La Premiere launch edition model is priced from £32,450 and comes with 18-inch alloy wheels, a premium advanced safety pack (adding active blind spot detection and speed limit recognition), DS Drive Assist with active cruise control and lane keeping assist, high beam assist and wireless smartphone charging. The DS 3 Crossback will initially be available with a choice of one diesel and three petrol engines, with an electric version due later in the year. The petrol line-up is made up of a 1.2-litre Puretech engine with 100PS, 130PS or 155PS power outputs. The diesel, meanwhile, is a 1.5-litre BlueHDi with 100PS. When it arrives late in 2019, the DS 3 Crossback E-Tense will have a real-world range of 186 miles thanks to a 136PS electric motor and a 50kWh lithium-ion battery located under the floor. Will Citroen and Peugeot ever make a decent manual gearbox ? The current 6-speed manual is excellent. The 5-speed manual isn't.